Consider this my warning to anyone who hates "bumpdates." I'm going to be cliche and do them because a) I've had a couple requests from friends and family to do so and because b) I think it will be fun to look back and remember little things like this. So, if you hate these things, feel free to ignore every bumpdate I ever post (I promise, I won't be offended). Anywho, I ordered a cute new swim top from kortni jeane for the summer (so that I'd actually have a suit that would fit me) and it came in the mail yesterday morning. 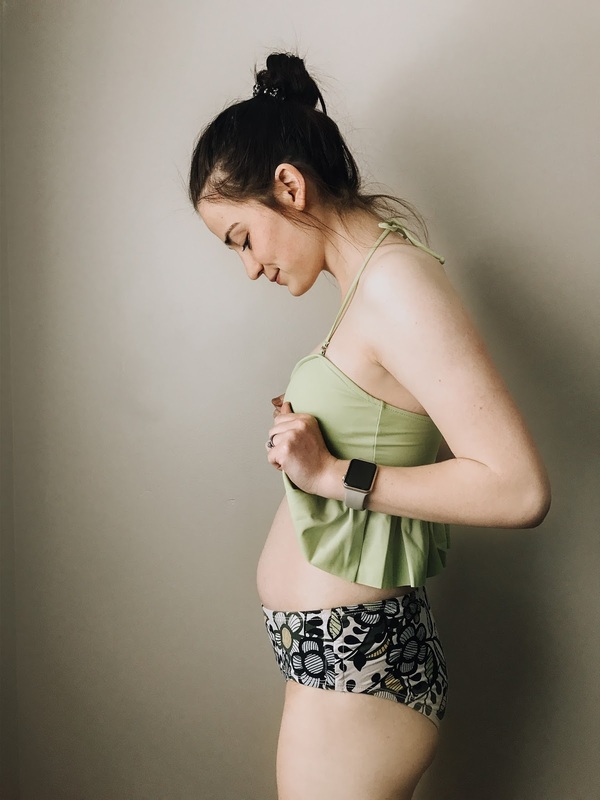 I was so excited about it that I had to try it on immediately-- which resulted in me looking in the mirror and seeing the little bump that my belly has become and it absolutely AMAZED me! So much has changed in just the last two weeks. I'm amazed at the whole growin' a baby thing that our bodies can do. It's so dang cool. baby: this week our little one is the size of a plum. cravings: baked potatoes, apple juice + ginger-ale concoctions, fruit popsicles, bagel bites (lol), and watermelon sour patch kids. hardest part about being pregnant: puking (unfortunately). Let's just say I was not blessed in the morning sickness department. best part about being pregnant: seeing the our baby grow a little more each time we go in for an ultrasound appointment. It's so cool to see the transformation from a little bean to actually looking like a baby (just with a really, really big head). Also, it's cute because from the moment I got pregnant, Kingsley hasn't left my side. He knew about the baby before we did, I swear. YOU ARE THE CUTEST! Please keep doing these, I love them!